Jean Vassilev Videnov - born on March 22, 1959 in Plovdiv. He graduated from the English Language School of Plovdiv, and later - from the Moscow State Institute of International Relations (he studied International Economic Relations). His political and party career started by managing positions in the communist youth organization Komsomol in the cities of Plovdiv and Sofia. 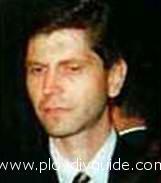 He later becomes a member of the Supreme Council of the Bulgarian Socialist Party (BSP) and its managing body. He was a M.P. and later a Chairman of the Supreme Council of the Bulgarian Socialist Party. When the coalition of BSP won the elections in the autumn of 1994, Jean Videnov was appointed the Prime Minister of Bulgaria. He started the mass privatization (the summer of 1996) and introduced the Currency Board. He resigned in December 1996 under the pressure of the Ministry of Internal Affairs when, after weeks of protests, Bulgaria was considered in danger of a civil war. Videnov disappeared from the political scene and his only public appearance seemed to be the publishing of his memoire book Political Theatre Off Stage. The Party Opposition.